A brief description of the new system for children and young people with special educational needs and disabilities with a comparison with the old system. It then goes on to talk about how to identify children with special educational needs, health and social care issues including Children Act assessments and Care Act assessments, the code of practice, the duty to delivery education and choice of schools, practical issues in relation to EHC Plans, information required to prepare a case and expert evidence, the right of appeal and mediation, appeals from the first tier tribunals enforcement, an interesting chapter called On the Naughty Step. There are some obvious ones such as solicitors representing local authorities against under-represented parents making some very inappropriate tweaks, less obvious is the fact that most families are not eligible for legal aid and in any event legal aid has never covered the hearing itself but does point to how legal aid can be obtained. It also looks at independent schools and where mistakes have been made, for example, ceasing to maintain the EHC Plan. “42 common problems: 42 is the meaning of life, the universe and everything and all that”. Then there are a number of appendices. One about reasons for appeal, two examples given. The next is two examples given of expert reports, the next appendix is the special educational needs and disability regulations 2014. Appendix 4 looks at the first tier tribunal procedure rules. Appendix 5 provides a table of cases and Appendix 6 is guidance for witnesses who seek to give expert evidence in SEND. 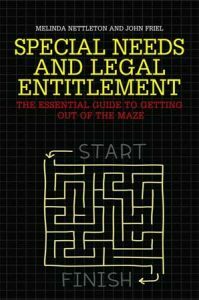 It is quite a thick book but I am sure would be extremely helpful for anyone who is trying to make sense of EHC Plans and their legal rights of children and young people with special educational needs. Indeed, one person describes it as the “must have book” in respect of the new Education and Health Care plans. I shall be bringing it along to the post-diagnostic support group. Anyone who has had experience of EHC Plans who might want to review it for us would be more than welcome.